Three years ago I left the employ of the last council I worked for when I took their voluntary redundancy shilling, part of the first wave of post-recession downsizing. What are the current big issues in local government? Well, I had to show willing didn’t I? 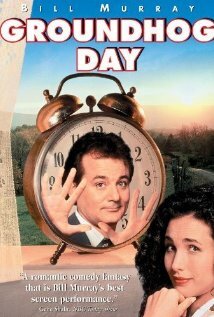 Just for an instant I had a Groundhog Day moment, the movie where time repeats itself for ever. Could it be true? Sadly it was. Of course (we were on to the baklava by now) there were some subtle differences as well as some similarities that we teased out. On shared services, not much had changed, except it was still being touted as a panacea for many ills and still without convincing examples of its success despite major effort put into it in some places. Maybe there are readers out there in local government land who can put us right and come up with some good case studies. Maybe not. The same script could hold true for outsourcing with some big potential contracts (sorry partnering) either not coming to fruition or not delivering the benefits claimed in advance. Partnership working is still the challenge it always was, with my ex-colleague coming up with some cracking examples of inept loading of council agendas on to indifferent partners. And I know from my own observation that the specific case of Scottish community planning now faces more imbalance, with two of the statutory partners – police and fire & rescue – moving to national services as power is inexorably sucked towards the centre (the old LECs, local enterprise companies, had already gone that way). Workforce planning seemed to have moved on a bit, at least in the sense that there was greater pressure to do it. We didn’t share notes on what it was like then and now but I hope it’s less of a nightmare than it was 4-5 years ago: the phrase ‘all-consuming industry’ would have summed it up as it was then. Interestingly, neither of us mentioned budgetary pressures in our lists. Of course they’re still there, and more pressing than ever. And money is the root of much of the push to share, outsource and work better together. It’s also not unrelated to the need for better workforce planning. But unlike the traditional parrot cry of ‘If only we had more resources’ good managers – and she is – tend to accept resource constraints and find other ways to maintain or even improve services. One thing we didn’t share was my belief that politics, no that’s not right – democracy, drives much of the reluctance to work in some of the ways our little lists highlighted. It’s not a criticism, just a fact of life. We don’t see national politicians, so keen to force these nostrums on local authorities, rushing to do the same at their level – share services with other countries, outsource them to the Far East, or tackle workforce planning on a Europe-wide basis. As for partnership, hasn’t David Cameron just distanced himself a bit more from the EU? So maybe it’s time to quietly abandon most of what’s on my ex-colleague’s list of issues and move on to other ways of doing the business. Anyone listening there? It was a good lunch with pleasant company, even if the Greek coffee gave me the caffeine tingles for the rest of the afternoon. Schools are there for children and their education. They’re not like adults, able to take responsibility for their own safety. Even if their safety can be ensured in school they’ve still got to get there and back. Students may be 17 or 18 but they’re also as young as five – younger if the school includes a nursery. If teachers have a class of 25 normally is it reasonable or effective for them to take, say, 50? If they teach English is it feasible to ask them to take a physics class? If they normally teach the 11 year olds can they cope with a class of five year olds, perhaps without a classroom assistant? The space may not be there to combine classes. And since it’s not always predictable which teachers will be able to get in, planning for how to combine classes may be impossible. Those other staff can include technicians, essential to the running of some science/technical subjects, catering staff, even the janitor. Operating without them can make as much sense as asking the MD to pop down to the shop floor, sweep the snow from the delivery bay, switch the heating on and get the production line going with half the workers missing. A roof has collapsed, snow has got in, the heating’s off, the water tank’s burst, the entrance is covered in ice. OK, maybe some of it shouldn’t happen, but it can, even in the best maintained premises. And if the staff can’t get in maybe the gas engineer or water company can’t either. A pretty obvious reason when children travel by car, public transport or school bus to school. The head teacher can command none of them to run a service. OK, so would you let the kids go without food? It may not only be the catering staff who can’t get in, suppliers might not be able to deliver food. Well, you might say, if they can’t cope with the younger ones, why not tell the older ones to get in? If some are revising for, or even taking exams, tell them they’ve got to get in but let the others stay at home. Ever heard of a logistical nightmare? Check some of the other reasons why school should close to see why part-opening may not be a good idea. If they genuinely can’t provide an education when the weather is bad, all schools will be offering is a basic child minding service. The poor old schools get enough dumped on them in the way of solving society’s problems. Why should they take on an added burden of parental responsibility or help sort what is at best a temporary problem for (some) other employers whose staff have to take time off to look after their children? You look out the window, it’s not nice but the roads are passable. Why’s the school closing? Check the weather forecast. The head teacher will. And if it’s going to get a lot worse during the day it’s not a good idea to have a building full of children unable to get home mid-afternoon. Sometimes schools just can’t overcome the impact of snow and ice. What they can do of course is make sure parents get good information as soon as possible about likely closures – online, text messages, local radio. Maybe the situation’s easier in those parts of the UK where Gove-ism hasn’t driven schools from the arms of the local authority and they can do a bit of co-ordination. In Scotland many local authorities have great online information about school closures. Take a look at Aberdeenshire’s web site for example, where as I write 123 schools in their large rural area are closed or partly closed. The head teacher’s responsible for getting information about their school online and it’s updated all the time. And you can get the information on a map, by RSS feed, Twitter or subscribe for e-mail alerts. That’s what I call a good service. Cross about the whole thing? Don’t worry, in a few days it’ll all be forgotten until the next spot of bad weather when the same old finger-pointing will start up all over again. There was an interesting if tetchy exchange between UK Government minister and Conservative party chairman Grant Shapps and Clive Betts, Labour MP and chair of the Commons Communities and Local Government Select Committee on BBC Radio 4’s Today programme yesterday (10 January). The Committee has just published a comprehensive and thorough report on the future role of councillors which says amongst much else that remuneration and support for local government councillors should be increased. People are reluctant to stand as councillors because the compensation is so low and the average age of councillors is now sixty. In his loaded contribution to a patchy discussion Shapps described councillors as ‘volunteers’ five times. …councillors are brilliant volunteers for their community…councillors shouldn’t be on paid terms and conditions…on the basis that they’re volunteers and volunteers aren’t usually paid…volunteering for your community and being involved in the neighbourhood you live in is I think a very important role for people…on the same basis of Clive Betts’ argument you would start to pay volunteerss in every different walk of life…like Scout leaders. They say everyone writes the history that suits their purpose but this is pernicious nonsense, and Shapps should know it. The equation of councillors with Scout leaders (and any other sort of volunteer) is complete bilge. Councillors have a role defined in statute, are democratically elected to public office, nearly all spend a lot of time doing the work often at unsocial hours, and are responsible, even in these straitened times, for major spending of public money. They are subject to a whole raft of requirements unlike volunteers. Anyone heard of a Scout leader who publishes their financial interests in a statutory register? If councillors are volunteers then so are MPs, 100 of whom have just told polling organisation YouGov that on average they deserve a pay increase of 32%! Apparently Conservative MPs thought they were most deserving of more money. Nice money if you can get it guys. The Shapps rewriting of history – and law – just doesn’t stack up. I hope Conservative councillors up and down the land are having a quiet word in his shell-like ear.